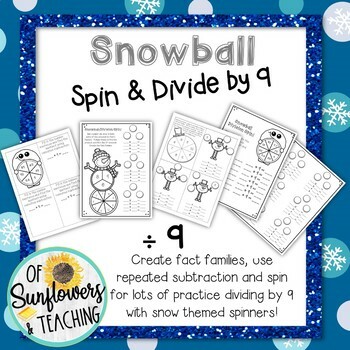 Snowball Spin and Divide by 9! Fun, engaging, no-prep practice pages! 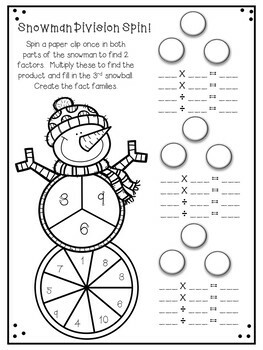 This set of 4 snow themed activity pages provide fun and engaging ways for students to practice dividing by 9. 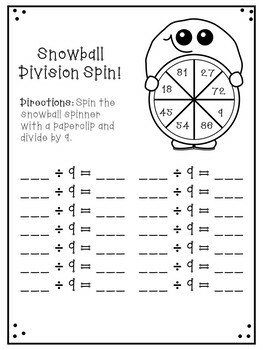 Students will spin a paper clip spinner to fill in missing dividends and factors, create fact families and use repeated subtraction to enhance their division skills. 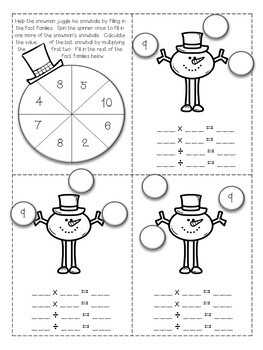 Great activities for math centers, partner work, guided practice, and more! • Please leave feedback to receive TPT credits to use for future purchases! • Each time you give feedback, TPT gives you feedback credits that you can use to lower the cost of your future purchases. • Your feedback is extremely appreciated as it helps me to continue improving my products and creating more of what would be valuable for your classroom!